In May, I attended the MCA zine fair, where I fell in love with Anna’s zine 20 Meals in NY. Anna has been so lovely and has kept me up to date with her meals/illustrations, so drumroll please – meals from ‘The River Cafe Cookbook’ by Rose Gray. 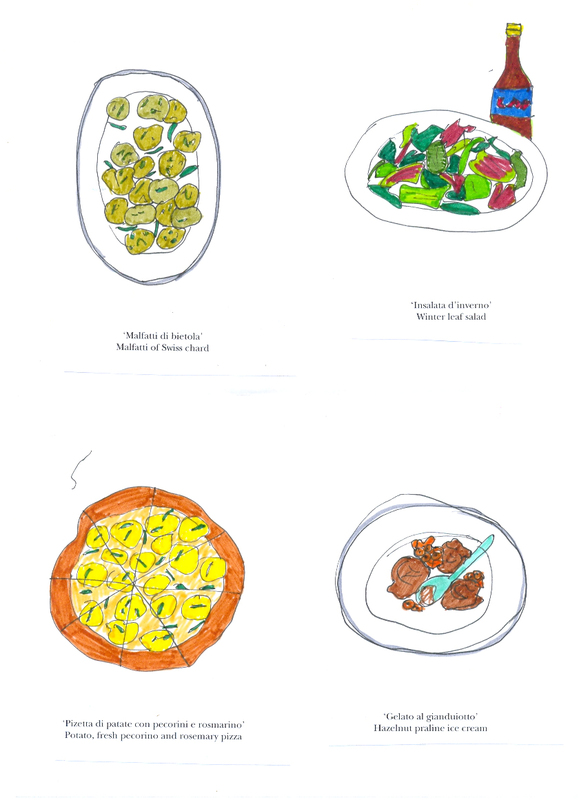 I really enjoy Anna’s illustrations because they feel fun and I can always imagine the food as symbols of the memories that went with the meals. With each one I can imagine the lighting of the restaurant, or the loud honking of the street in the background, the music in the shop and the person opposite me with a glass of wine and an expression that has just broken into a hurricane of laugher. You know, the joys of sharing food with those you love. ps – I feel this would be a good dinner party song: Jesse Cook’s version of Crowded House’s Fall at Your Feet. As would Erik Mongrain’s AirTap!